There is a step that is left out in the copy of the book that I have. It has you brown the sausage and set aside. It never tells you to put it back in. I made the recipe for a Christmas party and it got rave reviews. This is a crowd-pleaser every single time. Broiling the split rolls for a few minutes made a world of difference to the sandwich. I used smoked mozzarella left over from another recipe. Made this with rigatoni and Fairway bulk sausage. Very good, but think it could be better. It was probably the sausage. Try a different vendor or hot Italian next time. Could also use more broccoli. Maybe my heads were too small. Fast, easy, and delicious. We love it. Just as good if not better than what is served at Carmine's. I used whole wheat spaghetti. Served with a sprinkle of fresh basil chiffonade on top just like the photo on the cover of the book and grated Parmesan on the side. Excellent recipe for vodka sauce. Our favorite! The recipe for the crepes is way off IMO. I always have to add a ton more milk than what is called for. Other than that, this dish is fantastic. This dish is a labor of love but it is worth it. I usually make 2 at a time because it is just as much work (a ton) to do 2 as it is to do 1. Shoddy editing. Instruction tells you to saute sausage and vegetables and cool to room temperature, then mix egg and cheeses in bowl and refrigerate for 1/2 hr, but nowhere do they tell you to mix the two together. Also the ingredient list says one cup plus two tbs of Romano cheese, but the instruction directs you to mix 1/2 cup in with the other cheeses and the egg and sprinkle two tbs on top during assembly, so there is 1/2 cup of Romano that is not accounted for. The shells, however, were delicious, the smoked mozzarella brought a touch of smokiness to the filling which was lovely. For the record, I used 1/2 cup plus 2 tbs of Romano and had 12 well stuffed shells as stated by the recipe. SALMON PUTTANESCA p. 155 – A delicious variation on a classic Italian sauce that proved to be just fabulous on fish. I made the sauce in the morning so it had plenty of time for the flavours to develop. Instead of frying the fish, I decided to roast it since I had 2kg’s to contend with. I think the clam juice really helps marry the sauce with the fish and it also lightens an otherwise heavy sauce. Thrilled to have discovered this as we eat salmon on a regular basis and it’s nice to mix things up a bit. It tasted good but what a disaster recipe if you follow it to a T. It calls for 16 large shrimp and 4 t of garlic butter, and you are supposed to smear 1/2 t garlic butter on each shrimp, you do the math. Then it tells you to double the sauce ingredient if you want to serve it over pasta, since the garlic butter is spread over the shrimp, the bread crumbs pressed onto it and the lemon for garnish, that left the garlic and the 3/4 c clam juice as the sauce ingredient. I used a gratin dish, the shrimp covered the entire surface of the dish, I spread about 3 to 4 T of garlic butter on top and sprinkled the bread crumbs over the butter, doubling the sauce ingredient would mean 11/2 C of clam juice (I used shrimp shell broth), I started to pour in it around the edge of the dish and after about 3/4 C, the broth level was even with the shrimp, any more, the bread crumbs would all be soaky. Looking at Breadcrumbs' picture from the previous comment, I probably should have used a bigger dish. The bread crumb recipe is key here; so flavorful. Need to be careful not to overcook the shrimp when frying since it takes a while for the cheese to melt under the broiler and shrimp can get overcooked. Served this with the marinara poured over spaghetti and the shrimp on top. The best saltimbocca I've ever had. p. 283 - This recipe is called for in many other recipes in the book. I used some day old Calabrese bread and found it interesting that this recipe calls for the crusts as well. I froze what breadcrumbs we didn’t need for future use. These smelled incredible when I lifted the lid of the food processor! Most flavorful breadcrumb I've ever made. I quartered the recipe to make one cup so I don't have that much leftover. p. 266 – I initially prepared this for use in the Shrimp Scampi (p. 161) but there was plenty left over so I rolled it into a cylinder and froze it so I could cut pieces off as needed. Our preferred use for this is to make a quick grilled garlic bread. A nice staple to have in the freezer. I imagine it would make for a quick pasta too – just toss some of this butter into cooked noodles. p. 289 - Though we prefer my recipe, this produced a very tasty and quick marinara that I’d definitely make again when time is tight. It definitely reminded us of marinara’s we’ve been served at those little family owned Italian hot-table home-style restaurants. I withheld most of the herbs and stirred them in at the end as I don’t find basil in particular benefits from a long cooking process. Very tasty indeed. I was somewhat leery of the large amount (a quarter cup) of garlic used, but I soldiered on. The end result was delicious. I used home canned tomato from the garden and the whole amount of herb and then added some more fresh basil when served. These meatballs were great tender, juicy and delicious. I used 1.5 lb of ground beef and .5 lb of meatloaf mix. Not only did I not squeezed the milk out of the bread, I added the unabsorbed milk into the meat mixture as well. I weighed out each meatball to be about 3.1 ounces and I got 17 meatballs instead of 12. I also added a splash of white wine to deglaze the pan as the onions did not do a very good job of dissolving the fond. Everyone loves big platters of hearty, rich, delicious Italian food, and no one does it better than Carmine's, the most celebrated New York restaurant. 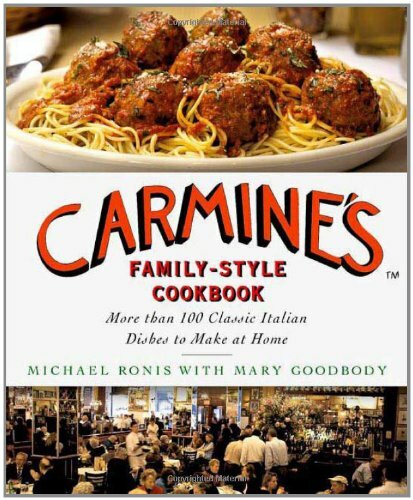 In this cookbook, they reveal the secrets of Carmine's longtime success. Carmine's restaurant packs them in every night in its four bustling locations--particularly in its warm, festive, burnished Times Square flagship, where over a million locals and tourists from all across the country come every year to share meatballs, chicken Parmigiana, linguini with clam sauce, and fried calamari. Carmine's flavors are the tastes Americans love to cook and eat at home--fresh garlic, bubbling tomato sauce, pasta boiled just to the perfect al dente. Now, in The Carmine's Family-Style Cookbook, New York's happiest restaurant gives us its secrets for over 100 perfect recipes from appetizers and heroes to pasta, fish and seafood, meat and poultry, desserts and much, much more.